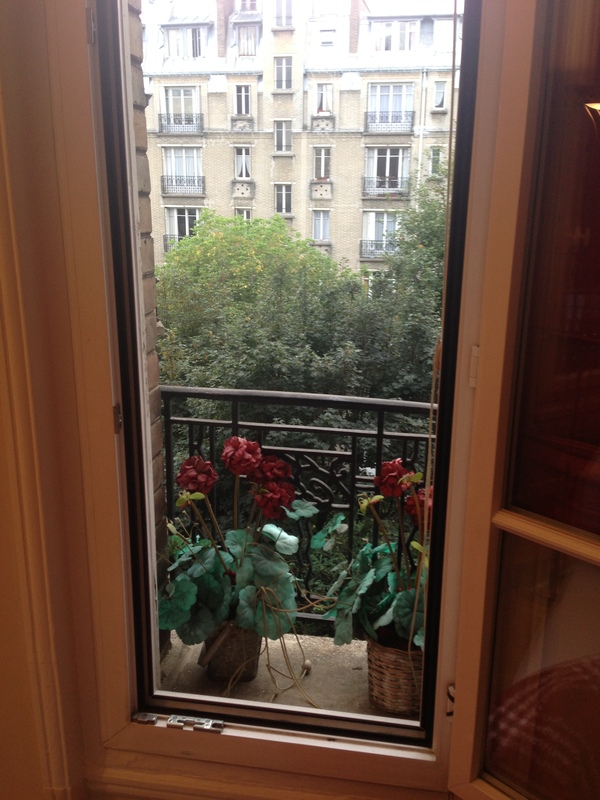 We are now in our Paris apartment-plane on time, not too jet-lagged, all keys and codes to get in worked, and we love it. After unpacking, we explored our neighborhood and tried to buy a weekly metro pass. My French may be a little rustier than I thought, so tonight I am planning what I need to say, and we are going to try again tomorrow. Feeling a bit grubby after being in our clothes for two days, we decided to dine in, and had a wonderful meal of wine, bread, four cheeses (never had any of them before), grapes, olives, and chocolate. After dinner, we took a little stroll to the Eiffel Tower. This is the view out our living room window. This entry was posted in Paris 2013 on September 7, 2013 by debbie.